A regular breeding resident and migrant throughout the state but most common in the southern two-thirds of Minnesota; regular in winter where there is open water. The Wood Duck was a common species during the Minnesota Breeding Bird Atlas (MNBBA). The Wood Duck’s primary breeding range extends across the eastern United States and the southern regions of eastern Canada; to the west a nearly disjunct population occurs from the Pacific Northwest south through California. Some of the highest breeding densities occur in portions of Wisconsin, Minnesota, and the Dakotas and along the lower Mississippi River valley (Figure 1). A game species, the Wood Duck is assigned a Moderate Continental Priority by the North American Waterfowl Management Plan and a Continental Concern Score of 6/20 by Partners in Flight. A short-distance migrant that winters father south in the central and southeastern United States. A dabbling duck, Wood Ducks feed on aquatic and terrestrial invertebrates, seeds, and fruits. A cavity nester that selects large, mature trees in riparian habitats; also uses nest boxes. Breeding distribution and relative abundance of the Wood Duck in North America based on the federal Breeding Bird Survey from 2011 to 2015 (Sauer et al. 2017). One hundred years ago the future of the Wood Duck was in doubt, not only in Minnesota but throughout its North American breeding range. Indeed, its extinction seemed by many to be imminent. Like so many waterfowl, prior to the enactment of hunting regulations the birds were harvested year-round, severely depleting populations (Bellrose 1976). In addition, loss of cavity trees due to extensive logging in the late 1800s and early 1900s likely contributed to population declines (J. Lawrence, pers. comm.). In Minnesota, Roberts (1932) wrote that the species was formerly an abundant summer resident but “greatly reduced in numbers” by the early 1900s. Only 1 confirmed nesting record (nest with eggs) was reported from Grant County, while young broods (inferred nesting) were reported in just 5 counties: Aitkin, Clearwater, Hennepin, St. Louis, and Stearns. When the Migratory Bird Treaty Act was passed in 1918, the hunting season on Wood Ducks was immediately closed and remained so until 1941. The response was nearly immediate. Only 16 years later, when Roberts published his two-volume treatise on Minnesota birds, he was already witnessing a small increase in the number of nesting pairs throughout the state. By the time Green and Janssen (1975) published an updated account of the species’ status, the Wood Duck had become the fourth most abundant nesting duck in the state (Lee et al. 1964). It was scarce, however, in the northeastern counties and was absent from the agricultural lands in the Red River valley and southwestern Minnesota. A little more than 10 years later, Janssen (1987) reported the species was expanding its range both to the north and west, particularly in the Red River valley and southwestern Minnesota. Although it remained uncommon in the Arrowhead region, breeding had been confirmed in Lake and Cook Counties in the late 1970s. Several years later, in a review of all confirmed nesting records since 1970, Hertzel and Janssen (1998) documented Wood Duck nesting records in all but 5 counties: Beltrami, Benton, Otter Tail, Steele, and Wilkin. Likewise, the Minnesota Biological Survey reported 618 breeding season Wood Duck locations during their statewide surveys, all widely distributed across the state (Minnesota Department of Natural Resources 2016). During the MNBBA, participants reported a total of 2,828 Wood Ducks records from 36.1% (1,738/4,821) of the atlas blocks that were surveyed and from 39.3% (918/2,337) of the priority blocks. Breeding was confirmed in 762 (15.8%) atlas blocks (Figures 2 and 3; Table 1). Not only were the birds reported from every one of Minnesota’s 87 counties, breeding evidence was collected from all but 2 counties: Traverse and Red Lake in northwestern Minnesota. The density of reports in the Twin Cities metropolitan area and in the Brainerd region is largely a reflection of the number of atlas volunteers concentrated in these areas. Despite their statewide distribution, Wood Ducks remain least abundant in the most heavily cultivated regions of the Red River valley and in far north-central Minnesota. The land suitability map for the species predicts that the most suitable Wood Duck habitat occurs across central Minnesota, from the Twin Cities metropolitan region northwest to the Hardwood Hills Subsection and south throughout southwest and south-central Minnesota (Figure 4). Although Wood Ducks are predicted to be sparse throughout the Red River valley and in the southeastern Blufflands Subsection, the rivers and streams in these regions still provide highly suitable habitat for this riparian species. More than 100 years after many predicted the species’ demise, the Wood Duck not only has recovered to the point of reoccupying most of its original breeding range, but populations have also expanded north in Canada, west in the Central Plains, and south into Mexico (Hepp and Bellrose 2013). Atlas projects have documented the species’ statewide distribution in the nearby states of Wisconsin (Cutright et al. 2006), Michigan (Chartier et al. 2013), Iowa (Iowa Ornithologists’ Union 2017), and South Dakota (Drilling et al. 2016). Wood Ducks occur statewide in Ohio, but the state’s second atlas documented a decline in one region where agricultural activities have intensified (Rodewald et al. 2016). Ontario documented a 53% increase in the probability of observing Wood Ducks between their first atlas (1981–1985) and second atlas (2001–2005). Part of the increase was attributed to the large number of Wood Duck nest boxes that had recently been erected in the Northern Shield region of the province (Cadman et al. 2007). Breeding distribution of the Wood Duck in Minnesota based on the Breeding Bird Atlas (2009 – 2013). Summary statistics of observations by breeding status category for the Wood Duck in Minnesota based on all blocks (each 5 km x 5 km) surveyed during the Breeding Bird Atlas (2009-2013). Summary statistics for the Wood Duck observations by breeding status category for all blocks and priority blocks (each 5 km x 5 km) surveyed during the Minnesota Breeding Bird Atlas (2009-2013). Landcover suitability of the Wood Duck in Minnesota based on habitat, landscape context, and climate data gathered during the Minnesota Breeding Bird Atlas (2009-2013) using the MaxEnt modeling approach. Wood Ducks select a wide variety of mature woodlands that border lakes, streams, rivers, and small wetland pools (Figure 5). Older trees provide nesting cavities, while shallow wetlands provide foraging sites for the adults and young broods. When natural cavities are scarce, the birds take readily to nest boxes. Cover also is important, particularly during brood rearing, and may be furnished by overhanging upland trees and shrubs, by fallen wooden debris, or by aquatic emergent vegetation. Large expanses of open water are generally avoided. Although nesting cavities adjacent to water are usually preferred, Wood Ducks may nest as far away as 2 km from the nearest body of water (Hepp and Bellrose 2013; Baldassarre 2014). A study conducted in Minnesota demonstrated that 70% of radio-marked females stayed within 1 km of the nesting cavity, suggesting that an area of approximately 3 km2 was needed by a single pair during the breeding season (Baldassarre 2014). Typical breeding habitat of the Wood Duck in Minnesota (© Lee A. Pfannmuller). The Wood Duck’s wooded habitat challenges efforts to effectively monitor long-term population trends. The well-established Waterfowl Breeding and Habitat Survey, the gold standard for monitoring waterfowl populations in North America, is more effective for species that nest in the wetlands of the open prairies and parklands where they are more easily detected than birds that breed in forested habitats. This international survey effort does not even tally Wood Ducks. In light of this dilemma, waterfowl biologists have relied on four other efforts to assess long-term population trends and estimate population numbers across North America: (1) the federal Breeding Bird Survey (BBS), 2) long-term monitoring of nest boxes, (3) examination of wings of harvested birds (which provides an estimate of productivity), and (4) harvest surveys and recoveries of banded birds during the fall hunting season (Davis 2016). Although the BBS was designed primarily to effectively monitor songbirds, not waterfowl, it does provide a reasonable index of long-term trends for common and widely distributed species like the Wood Duck. Since the survey began in 1966, Wood Ducks have shown a significant, long-term increase in numbers across North America, averaging an increase of 1.63% per year. Since 2005, the annual increase has risen even higher, to 2.67% per year (Sauer et al. 2017). 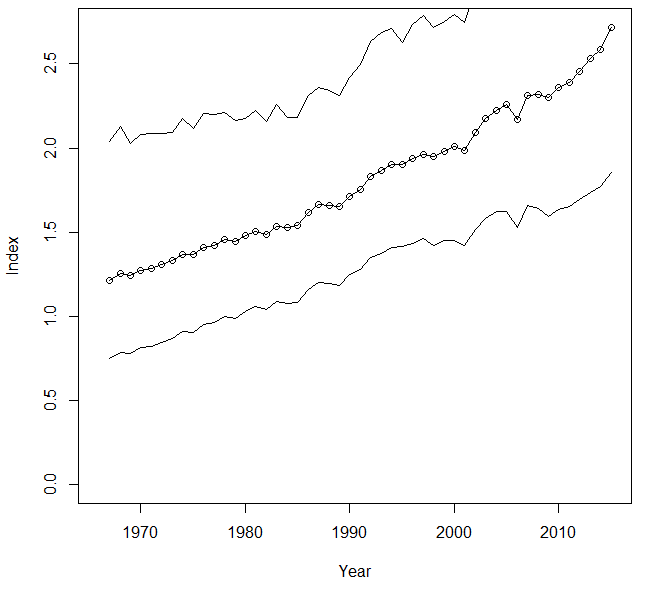 In Minnesota, the BBS trend data for the state mirrors the increase seen across the species’ breeding range, with a significant annual increase of 1.70% per year from 1967 to 2015 (Figure 6). The principal factors responsible for the species’ population growth include strictly managed harvest regulations, protection and restoration of riparian wetlands, and the gradual maturation of forests in the northeastern United States following the abandonment of small farmsteads. In some areas, intensive efforts to establish nest box programs also may be helping local populations. In Minnesota, waterfowl biologists have another tool to assess Wood Duck populations. Begun in 1968, the state Waterfowl Survey is a more targeted tool to monitor waterfowl populations in the portion of Minnesota (39% of the state) that supports the highest density of lake basins outside of the densely forested region of northeastern Minnesota. This tool, designed principally to monitor wetland waterfowl that are common in western Minnesota, shows quite a different population trend for Minnesota Wood Ducks. 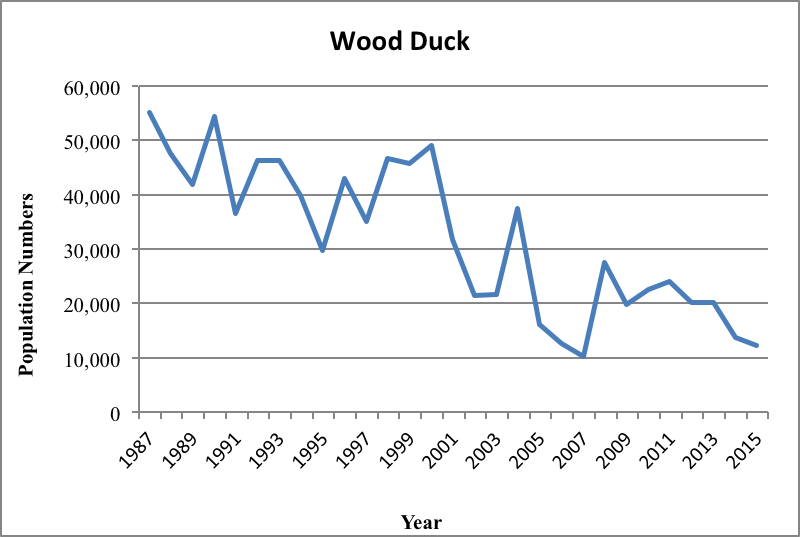 Indeed, it shows a steep decline in Wood Duck numbers, particularly since 2001 (Figure 7). Like the federal Waterfowl Breeding and Habitat Survey, the Minnesota Waterfowl Survey is conducted by air, so it has the same challenges in accurately surveying forest ducks. That, coupled with earlier leaf-out dates as the climate warms, might explain some of the lower numbers. Earlier leaf-out dates make it more difficult to detect Wood Ducks. The different population trend lines demonstrated by the BBS and the statewide survey may indicate that neither monitoring tool is entirely effective for the woodland-dependent Wood Duck, or may indeed signal that Wood Ducks are doing well at the statewide level but are experiencing local declines in those areas more intensively surveyed by the Waterfowl Survey. Mallards and Blue-winged Teals, the two most abundant duck species in the state, have both declined in recent years in the same survey region, as have several other waterfowl species (Cordts 2015). At the state level, wetland quantity and quality are widely cited as the factors negatively impacting the state’s waterfowl population. Despite their rebound from nearly devastating declines in the early 1900s, less than ideal wetland conditions at the local level may be influencing Minnesota Wood Duck numbers. Nevertheless, west-central Minnesota still supports some of the highest breeding densities of Wood Ducks in North America (Figure 1). A diversity of data are collected on Wood Ducks yet a precise estimate of the species’ population size is difficult. More than 20 years ago, Bellrose and Holm (1994) estimated the population at approximately 2.8 million birds. Ten years later, in 2004, the North American Waterfowl Management Plan placed the estimate at 4.6 million birds (North American Waterfowl Management Plan 2004). Waterfowl biologists in Minnesota estimate the statewide population at approximately 100,000 birds (Minnesota Department of Natural Resources 2016). Breeding population trend for the Wood Duck in Minnesota for 1967–2015 based on the federal Breeding Bird Survey (Sauer et al. 2017). Wood Duck numbers reported during the Minnesota Waterfowl Survey, 1987–2015 (data not corrected for visibility; taken from data presented in Cordts 2015). Other than the Eastern Bluebird, there is no other bird species in North America for which the general public has been so actively engaged in its restoration. The Wood Duck’s ready acceptance of nest boxes led to a plethora of local conservation efforts across the United States focused on building, maintaining, and monitoring Wood Duck nest boxes. At a continental level, the overall reproductive contribution of nest boxes has been estimated at just 4% to 5% (Bellrose 1990), but at the local level their impact can be much higher (Baldassarre 2014). In light of its successful recovery, its wide distribution, and its relatively large population, Partners in Flight (2017) has assigned the species a relatively low Continental Concern Score of 6/20. The long-term key to the Wood Duck’s survival is habitat that provides elements critical to the species’ nesting success: mature forests that provide nesting cavities, and good-quality wetlands located nearby. Forest management practices that emphasize the protection and restoration of riparian forests are one of the most important management tools available. In Minnesota, implementation of site-level forest management guidelines developed by the Minnesota Forest Resources Council is especially critical (Minnesota Forest Resources Council 2013). A popular species among waterfowl hunters, in the fall of 2015, Wood Ducks comprised approximately 8.6% of the total duck harvest in the United States (a total of nearly 942,000 birds harvested). The 2015 harvest of Wood Ducks in Minnesota comprised nearly 14% (114,620 birds) of the entire harvest (Raftovich et al. 2016). Wood Ducks are one of the most commonly harvested duck species in Minnesota, second only to the Mallard. The North American Waterfowl Management Plan (2004), which provides strategic guidance for managing all waterfowl species, has designated the Wood Duck a Moderate Continental Priority. Climate change is a major challenge to the species’ future. A recent analysis of the potential impacts of a warming climate on 588 North American birds by the National Audubon Society classified the species as “climate threatened” and predicted that the Wood Duck’s current breeding range could decline by 69% by the year 2080, forcing birds to move farther north into central Canada (Langham et al. 2015; National Audubon Society 2016). The availability of sufficient mature trees with cavities will be critical in determining if the species can adapt to such change. Bellrose, Frank C. 1976. “The Comeback of the Wood Duck.” Wildlife Society Bulletin 4: 107–110. Bellrose, Frank C. 1990. “The History of Wood Duck Management.” In Proceedings of the 1988 North American Wood Duck Symposium, edited by Leigh H. Fredrickson, George V. Burger, Stephen P. Havera, David A. Graber, Ronald E. Kirby, and T. Scott Taylor, 13–20. St. Louis, MO. Bellrose, Frank C., and Daniel J. Holm. 1994. Ecology and Management of the Wood Duck. Harrisburg, PA: Stackpole Books. Lee, Forrest B., Robert L. Jessen, N. J. Ordal, R. I. Benson, J. P. Lindmeier, and L. L. Johnson. 1964. Waterfowl in Minnesota. Minnesota Department of Conservation Division of Fish and Game Technical Bulletin No. 7. Minnesota Forest Resources Council. 2013. Sustaining Minnesota Forest Resources: Voluntary Site-Level Forest Management Guidelines for Landowners, Loggers and Resource Managers. St. Paul: Minnesota Forest Resources Council.